Mt. Sneffels Press is proud to present our Fantasy Catalog for your ordering convenience. ISBN 9781499306446, 177 pages, softcover, $8.95 + $3.50 S&H. Shipping is to USA only; For international options use the contact me page for more info. Read more about Dave. The Handwritten Book: Go straight to checkout! The Berki Blunder: Add to your shopping cart! You can view your cart at any time! 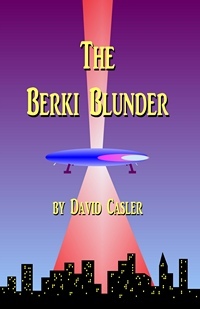 The Berki Blunder is also available on Amazon by clicking here. John, Conan, and Alex, all age 10, create a broomstick from instructions in the handwritten book they get from an elderly fortuneteller at a Mædieval Faire near Manchester, England. She sees them flying a broomstick in her crystal ball and insists the book must be theirs, much to the dismay of her brother, Marco. Marco dogs the boys, attempting to retrieve the book, which contains secret after secret about magic, but the boys elude him and construct their flying broomstick. The key to getting the broomstick to work is to place it atop the highest tower at Castle Alox at midnight during the full moon. The broomstick must be covered with goat entrails and a dead snake, and lightning must strike the tower at midnight. But where is Castle Alox? Will they get away from the evil Marco? This book tells all! A little background: The books in my fantasy series, called The Story of the Great American Flying Broomstick (see below to order), make frequent reference to a series of books—and the resulting movies—called Three on a Broomstick. The idea is that the hero of the American Flying Broomstick books is motivated and inspired by the eight young-adult books and movies in the Three on a Broomstick series. Its putative author, Alec Pringle, writes one of these books every year, detailing the adventures of John, Conan, and Alex, who possess a flying broomstick and use it for wondrous and magical adventures. The boys create their broomstick following instructions in a handwritten book given to them by an old fortune teller. 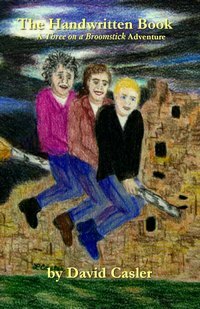 And the Three on a Broomstick books are turned into movies by the fictional High Summit Motion Pictures. You can learn all about it in the American Flying Broomstick series. The Three on a Broomstick series was not intended to exist in reality—it was only a literary device. That is…until now. This is the first book in the Three on a Broomstick series, The Handwritten Book. Yes, there is a book within this book. And since this book is within the American Flying Broomstick series, the old, handwritten book is a book within a book within a book. And it’s full of magic. ISBN 9780615965635, 147 pages, softcover, $7.95 + $3.50 S&H. Shipping is to USA only; For international options use contact me page for more info. Read more about Dave. The Handwritten Book: Add to your shopping cart! Note that The Handwritten Book softcover book is also available on Amazon by clicking here, and is available on Kindle by clicking here. 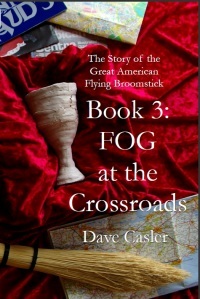 The third book in the American Flying Broomstick Series, FOG at the Crossroads. Book 3 in the American Flying Broomstick series starts with a bombshell. The tiny Fraternal Order of the Grail (FOG), the group that has safeguarded the Holy Grail for two millennia, has misplaced it. The Keeper, Reggie Baker, moved the Grail to its new secret repository and then died while walking his dog—before he could tell the other brethren where he’d put it! The loss causes a rift between powerful American brother Hal Bender and the English branch centered in London, and Dave is caught in the middle. Dave makes haste to London to organize FOG’s new young novices to find the Holy Grail—by using flying broomsticks, of course. But the media is full of rumors that FOG will take back the Power that enables broomsticks to fly. And the sinister Plasma Vortex organization is after Dave’s wand so they can use its power for extortion and general mayhem. FOG at the Crossroads records Dave’s high adventure in the American West and in Southern England. Come along for the wild ride! But you can purchase this book on Amazon Kindle at this link.You can read Amazon Kindle books on your tablet (Android or iPad), laptop, smartphone, or computer using the free Amazon Kindle app. Book 2 picks up right where Book 1 left off: the flying broomstick has been released to the public. And the public has a few problems, not the least of which is that the FAA is outraged at this incursion into their airspace. Broomsters are forming clubs all around the world to exploit this wonderful revolution in personal transportation. They even organize broom races as the phenomenon grows exponentially, sweeping the globe. Dave has just one little problem. The wand he used to create flying broomsticks is stolen. Where is it? It seems a minor problem, since Dave can make another wand, but soon he finds the missing wand has powers hitherto unimagined and therefore must be recovered. But how? And the Three on a Broomstick crowd make a reappearance, this time in Colorado. 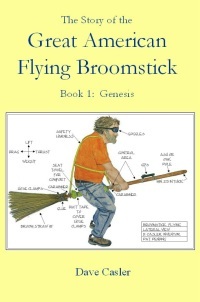 Read Book 2 in the series to see how the flying broomstick can revolutionize your life too! Broom 2: Go straight to checkout! Broom 2: Add to your shopping cart! This is where the story starts! Hold onto your hat—it's a wild ride! Book 1: Genesis tells the story from the beginning. In 2005, Dave, an engineer for a large computer company, stumbled into a highly secret organization in London called the Fraternal Order of the Grail (FOG). These elderly gnomes are all that remains of a proud organization that to this day guards the Holy Grail as well as the sole remaining remnant of Moses’ staff. Unbeknownst to FOGgers, they were also sitting on an unusual power of immense proportions—something they’d never studied. After his accidental induction into FOG, Dave went home to Colorado to experiment with this newfound power, embodied in a wandlike “rod” that can levitate objects, start fires, create water and even make carrots! 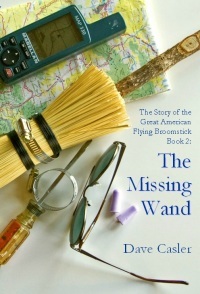 Given Dave’s infatuation with the young adult fantasy book/movie series Three on a Broomstick, he attempted the creation of a real flying broomstick. He succeeded! But his success soon got him in over his head. The flying broomstick became public after Dave accidentally flew through a tree during flight trials and needed urgent medical attention. He was seen. Dave jousts with the news media, the FAA, the studio that brings us Three on a Broomstick, the Air Force, and Congress. And what happens at the very end that persuades Dave to give away the technology to anyone who wants it? All is explained in The Story of the Great American Flying Broomstick, Book 1: Genesis, which sets the stage for adventures yet to come! 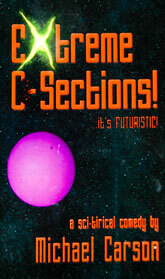 ISBN 978-0-9800603-0-3, 288 pages, softcover, $9.95 + $4.00 shipping and handling. Read more about Broom 1, view the video, and read excerpts (takes you to book website) or order here. Shipping to USA; International options available on checkout. Read more about Dave. You don’t have to be a PayPal member to use PayPal. See here for more info. Broom 1: Go straight to checkout! Broom 1: Add to your shopping cart! The year is 9998, and humans have finally freed themselves from the constant harassment of otherworldy destroyers, invaders and probers. The parting is sweet but short, as one small mistake leads to Earth Three’s biggest situation yet! ISBN 978-1419649219, 376 pages, softcover, $17.99 price + $4.00 shipping and handling (USA—International options available at checkout), Published by Booksurge. You don’t have to be a PayPal member to use PayPal. See here for more info.